Throughout its long history, boxing has produced many excellent warriors who have thrilled spectators with their courage and ability within the roped square. One of boxing’s greatest ironies is that the bigger fighters, at the higher weights, have historically been seen as the more exciting members of their sport and so have generally commanded higher attention and bigger purses than their smaller counterparts receive. 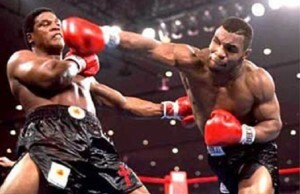 However, this has always been a bit of a misconception of boxing. Many an astute follower of the game will gladly tell you, that while, the bigger heavier fighters do indeed provide plenty of thrills and spills, there is nothing quite like seeing two finely matched fighters of 126 pounds or below, going full pelt at each other. Heavyweights may provide more power per punch in their contests, but boxing’s little men can seldom be beaten for the intensity, speed and viciousness of their fights. Boxing has been blessed by many exciting fighters in the lower weight divisions, many of whom have never quite received the recognition due to them, often simply because their size. One fighter who fits very well into this category is Masahiko ‘Fighting’ Harada, one of the most dynamic and exciting fighters of his era. If ever a fighter earned his nickname, then Harada did; he was truly a little ball of non-stop movement and whirring fists, a five foot three inch human dynamo, whose non-stop attacks echoed the fighting style of the great Henry Armstrong. Harada did not carry a particularly big punch, but he threw so many, with such an inexhaustible relentlessness, that many opponents were either overwhelmed, or steadily worn down. Yet Harada was not simply a one dimensional blood and guts brawler, there was an educated method to his hyperactive attacks. Harada had fluidity of style and movement, including good footwork and head movement, which made him harder to hit than would be expected; given his generally aggressive manner. Harada’s attacks, despite their high speed and density, were also high on accuracy, with few punches wasted. Harada’s assaults to body and head were masterful examples of infighting at its best. This educated aggression was backed up by a surprisingly formidable jab, despite his size. Harada could jab and box brilliantly when he wanted and his quick and stinging jab often paved the way for the full throttle assaults from both hands. Few fighters seemed to enjoy their work more than Harada. He fought with the relaxed air of someone doing something they truly enjoyed. Indeed, in many of his fights Harada was so eager to get back to work that at the beginning of a round he would jump up from his stool and run out into mid-ring to meet his opponent. One curious and disarming feature of Harada was that he would attack an opponent with a hurricane of leather all through a round, but, at the sound of the bell, shake his opponents hand/glove before returning to his corner. Fighting Harada turned professional on February 21, 1960, two months before his seventeenth birthday. 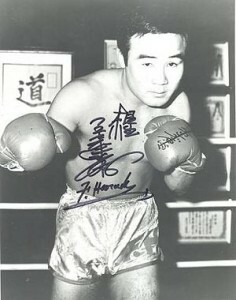 Harada showed his intention to be a busy fighter from the start, fighting thirteen times in 1960 and nine times in 1961. By 1962, with just two years of professional fighting under his belt, Harada was already rated in the world’s top ten, and on October 10, 1962, he was given a shot at the World Flyweight champion Pone Kingpetch. Harada pulled off a huge upset when he knocked out the great Kingpetch in the 11th round, to win the World Flyweight championship and become the youngest flyweight champion ever at just 6 months past his nineteenth birthday. Kingpetch had been surprised by the strength and ferocity of his young challenger and found himself unable to hold him off. Harada cut and battered Kingpetch throughout their fight, before sending him down for the full count in the 11th round, with a frenzied head and body attack. It was a huge win for Harada and made him a national hero in his native Japan. But, one of the conditions of Harada gaining the world title shot was a rematch clause that stipulated that if Harada won, he would have to give Kingpetch a rematch in his home city of Bangkok within 90 days. In the rematch, on January 12, 1963, Kingpetch was better prepared for the dynamo in front of him and gave a great exhibition of counterpunching, while Harada, who had struggled to make the 112 weight limit, pursued his challenger manically, and tried to ignore the counters and jabs that were coming his way. As in their first match, the fight was keenly contested, but this time Kingpetch’s brilliant display of boxing on the retreat, in his home city, was enough to see him regain his World Flyweight crown. Although he could have had a third fight with Kingpetch, the stockily built Harada, who had the habit throughout his career of piling on the pounds between fights, decided instead to move up to Bantamweight. Soon the world’s top 118 pounders were being confronted by the whirring fists of Japans pride and joy. If Harada had been a precocious talent at flyweight, he really found his true place at bantamweight, with added strength and maturity making him an even more formidable force than he had been at the lighter weight. Over the next two years, Harada ran up eleven wins in twelve contests, his only defeat coming at the fists of the dynamite punching Mexican Joe Medel, on September 26, 1963, just eight months after his point’s defeat to Kingpetch. Harada was stopped after being knocked down three times, in the 6th round. Medel was a notoriously dangerous puncher, but the fearless Harada went toe-to-toe with him in a fight that had some breathtaking exchanges. Going into the 6th round, Harada was ahead on points, due to his sheer volume of punches enabling him to force Medel back. However, in the 6th, Harada became over confident and elected to exchange one bomb too many with the Mexican knockout artist, and was floored heavily by a hook to the chin. Harada got up at 9, but was soon down again from a barrage of lefts and rights from Medel. Once more Harada regained his feet again, just beating the count at 9, and Medel was soon on him again, sending the dazed Harada down for a third time with another right hook, signalling the end of the fight due to the 3 knockdown rule. Like all true warriors, Harada took his defeat with a shrug of his shoulders, and carried on fighting his way up the bantamweight division. 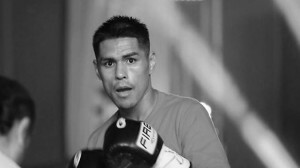 Seven wins and 20 months after the Medel defeat, Harada was challenging the great Eder Jofre for the World Bantamweight championship. Going into their fight, Harada, though well respected, was a heavy underdog against the Brazilian world champion. Jofre was already a legend and viewed by many as the best boxer p4p in the world. Jofre was a rarity in boxing, a complete boxer, able to brawl or box, and equipped with both classical boxing skills and a knockout punch in both fist. It was no surprise that he was unbeaten still and even at 30 years of age and 4 years into his championship reign, he had shown no signs of slipping. For many… Jofre was simply unbeatable, but, few men are truly unbeatable, and no sport illustrates this fact so well and often so devastatingly, as does boxing. Harada produced a masterpiece of offensive fighting against Jofre, to become the first (and only) man to beat the Brazilian, and snatching from him the World Bantamweight crown. Jofre so experienced and usually so poised in the ring, simply didn’t know how to handle the fistic cyclone in front of him. Harada fought with an intensity that seemed almost uncontrolled at times, his two-fisted attacks to the head and body, the way that he swarmed all over Jofre, and never let him get into his rhythm or fight at his own pace, was sheer perfection. Seldom has there been a better example of offensive fighting. When Jofre did manage to gain enough room to fire of some punches of his own, he found that the bobbing and moving Harada was not an easy target to catch. Those punches that did land were simply shaken off by the Japanese warrior. To add insult to injury, Harada was able to out-jab Jofre at times, as the harassed Brazilian found himself driven back onto the ropes again and again, where Harada would launch furious two-fisted combinations to his head and body. Harada, literally sprinted from his corner at the start of every round, and seemed to go about his work with an unabashed glee. Jofre’s discomfiture seemed complete when at the end of every stanza; the little Japanese tornado in front of him would abruptly end his seemingly inexhaustible assault, and offer Jofre his hand. Such politeness from someone who is punching you around the ring can be quite devastating in its own surreal way. 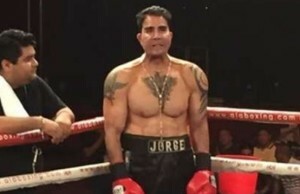 The point’s decision, when it was announced for Harada was close, but Jofre’s exhaustion after 15 rounds at the fists of Harada was clear for all to see. In winning his second world championship at the early age of 22 years old and against such an esteemed champion, Harada showed himself to be something a little bit special. After holding onto the flyweight championship for 3 months, Harada set about amassing an impressive bantamweight reign. Over the next two years and nine months, Harada made four successful defences of his World Bantamweight title, mixed in with seven non-title bouts. Each of Harada’s defences turned out to be a little classic in its own right. Harada’s first title defence came on November 30, 1965, against the plucky and skilful British champion, Alan Rudkin, in front of Harada’s adoring fans at Tokyo. Under constant fire from Harada from the first bell, Rudkin gave a memorable performance of boxing skill and courage, but could not match the champion’s strength and intensity, and was out-pointed after 15 high-paced rounds. Seven months later, Harada defended against Jofre and proved that his first win over the Brazilian was no fluke. Even though the former champion got off to a quicker start this time round and landed some good counters, the marauding champion would not be denied, and as the fight progressed, whittled away Jofre’s strength with his non-stop attacks to body and head, mixed in with some very good boxing, which saw Harada out-jabbing the former champion. By the final rounds, Jofre was bloodied, exhausted, and although the point’s verdict for Harada was again close, his victory was emphatic in every other way. In fact, Jofre was so thoroughly beaten by Harada, that he announced his retirement from boxing, only to return after over three years later, and in what must be seen as one of boxing’s great comebacks, go on and win the World Featherweight championship at the age of 37 in 1973, before finally retiring for good in 1976. Throughout his amazing ’70s comeback Jofre had 25 contests, winning them all, and making Fighting Harada the only man to ever defeat him. After his second win over Jofre, Harada’s next defence of his Bantamweight title was on January 3, 1967, against his former conqueror, Joe Medel. This time against the hard-punching Mexican, Harada fought a far more intelligent fight, using his boxing skills to outbox and outmanoeuvre the challenger, for a clear point’s victory. Harada mixed jabs, movement with well-placed combinations, in what was another tense and action packed 15 rounds. Six months later, Harada made his 4th defence against Columbian Bernard Caraballo, and despite retaining his title on points, he struggled at times with the clever and fast Columbian and showed signs that making the 118-weight limit was taking its toll on his energy and stamina. February 27, 1968, against nineteen-year-old Australian Aborigine, Lionel Rose. In what was a big upset, a somewhat subdued Harada, who once again had fought a fight with the scales in the run up to this contest, found himself out-speeded and out-boxed, by the mercurial Rose, losing his title on points. This signalled the end of Harada’s days at bantamweight, his battleship-proportioned physique could no longer get him down comfortably to 118 pounds. So, Harada set his sights on the featherweight division and a historic 3rd world title. With the multitude of weight divisions and ’world champions’ currently prevalent in modern day boxing, it can be difficult to appreciate just how hard it was to win more than one world championship in ’the good old days’ pre-multiple world titles. 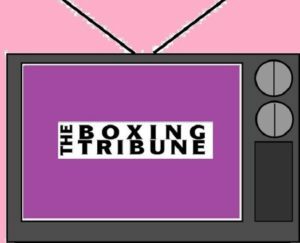 Up until the 1970’s, only four men had achieved the feat of winning world titles in three different divisions, Bob Fitzsimmons, Tony Canzoneri, Barney Ross, and Henry Armstrong. Unlike the majority of today’s multiple titleholders, these men had to beat the genuine number one fighters of their weight divisions, in order to win their world titles. After losing his bantamweight crown to Lionel Rose, Fighting Harada set his sights on becoming the 5th man to achieve three world titles, at three different weights. Over the next 12 months, Harada put together a run of four wins, against one defeat (a split decision points defeat to the tough Alton Colter), to earn himself a shot at the World Featherweight championship, held by Australian Johnny Famechon. The contest was fought at the Sydney Stadium in Sydney, Australia. Famechon was from a fighting family, whose older brothers had been boxers, and had risen to the top of the sport after having had no amateur career at all. Despite his lack of amateur experience, Famechon was an exceptionally skilful boxer with great defensive skills and a masterful left jab. Yet, all Famechon’s skill and ability were blown away into the air as Harada fought like a man inspired, swarming all over the champion from the opening rounds, and flooring him in the 2nd, 11th and 14th rounds. Famechon showed immense courage to survive the knockdowns and keep attempting to fight back, but his jabs were constantly shrugged off and walked through by Harada, as he continued his rampage forwards. Famechon’s desperation to survive saw him resorting to running away from his tormentor, as he seemed more than once to be just one solid punch away from being knocked out. The last three rounds were all Harada, as he chased and battered the Australian and seemed to have clearly sealed his victory and a historic third world championship. Somehow, Famechon made it to the end of the 15 rounds, but his title seemed to have gone. However, at the final bell, instead of having his hand raised in victory by the referee and sole judge, Willie Pep (the former all time great World Featherweight champion of the 1940’s and 50’s) Harada looked on in sheer astonishment, as Pep raised both his and Famechon’s arms at the finish, signalling that the fight was a draw, and therefore saving the Australian from losing his title. In the chaos that followed, Harada’s corner demanded that Pep’s scorecard be recounted, which it duly was, only for it to be discovered that Pep had added up his score card wrong, and he had in fact judged Famechon the point’s winner. After a long delay, Famechon was finally announced as the winner, the news was greeted by huge boos and catcalls by Famechon’s own home crowd, who had by now, totally sided with the bemused and furious Harada. Even taking into consideration that Pep, having been one of the finest exponents of the sweet science in his day, may have appreciated Famechon’s display of boxing on the retreat, while under fire, a little more than every body else, his verdict is still hard to justify in any shape or form. The most charitable thing that can be said about Willie Pep’s judgment that night is that he was a far far better boxer than he was a judge or referee. When the storm had died down, despite all the controversy and chaos, the verdict stood, and Harada had been denied a victory that would have placed him up with an elite group of champions. Despite keeping his title, Famechon was a tainted champion, and six months later on January 6, 1970, Harada got a second shot at Famechon, this time in Tokyo, Japan. After what had happened in the first fight, Harada went into this rematch a solid favourite to revenge the controversy of the previous match and capture a coveted 3rd world title. However, sometimes a boxer’s time can run out seemingly overnight. night. Famechon floored Harada in the 12th round, and in the 13th began tagging him with uppercuts, and crosses, as Harada now sought to hold on. In the 14th, sensing his opponent’s weakness, Famechon unleashed a barrage of punches, and sent Harada tumbling back through the ropes, and out of the ring. Although Harada was pushed back into the ring, and bravely regained his feet, he was counted out. It was the end of the line for this Japanese fighting machine. Fighting Harada, wiser than so many great fighters, both before and after him, retired and never fought again. It is a cruel irony, of a type often found in boxing, that while Eder Jofre often finds his way into people’s all-time greats top ten lists, the only man to beat him, not once but twice, is all too often conspicuous by his absence. There is no doubt that Jofre deserves his place amongst the all-time greats and that his record speaks for itself, but at the same time, Harada seems to be so often overlooked, and to have his own greatness under played. One wonders whether this would still be the case had Harada not been robbed of a rightful third world championship in his first fight with Johnny Famechon. The boxing fraternity love records, and boxers who make them and break them, and if Harada had been granted his rightful win against Famechon, there is little doubt that the status he would have received for being just the fifth man to win world titles at three different weights, would have gained him a much higher profile amongst the all-timers today. As it is, Harada seems somewhat forgotten today, certainly underrated. His record speaks for itself, and were it not for some dubious refereeing, he would have secured an even greater place amongst the legends of the ring. After his retirement, Harada stayed close to boxing, working as a trainer and for the Japanese boxing commission, and remaining a familiar face at ringside for the big fights in Japan. 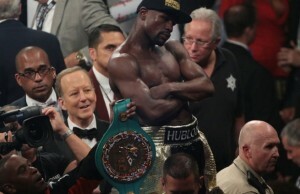 Perhaps it should come as no surprise, that the happy warrior should remain so passionate about boxing.